Facebook is expanding its interest in artificial intelligence by creating a new AI laboratory and selecting New York University professor Yann LeCun to head it up. "Facebook has created a new research laboratory with the ambitious, long-term goal of bringing about major advances in Artificial Intelligence," LeCun announced on his Facebook page today. The social networking company is also entering into a partnership with New York University's Center for Data Science to carry out research in data science, machine learning, and AI. The brainy group will have locations in Menlo Park, London, and at Facebook's new facility in New York City, right up the street from where LeCunn will still teach part time. LeCun's hire could act as a long-term method of improving Facebook's already sophisticated social graph, which determines the stories pop up on your News Feed. It could also act as a way to counter Google and its own artificial intelligence endeavor with futurist Ray Kurzweil that was announced earlier this year. Both companies are competing to have computers better understand human language by hiring top minds from the outside. Yahoo, similarly, is scooping up whole companies dealing with natural language. 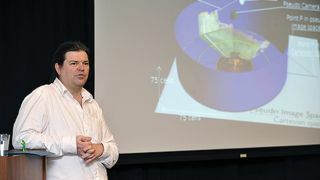 Since LeCun didn't have a whole lot of details to share in his post, TechRadar contacted him and Facebook for more about how such AI research will benefit the end user. We will update this story if we hear back. In the meantime, LeCun did mention that Facebook is hiring the most intelligent among us for its newly formed artificial intelligence lab. Read: Facebook's Year in Review shows everyone gossiped about the Pope, Royal Baby.